The Wabeno Point – Burnt Island is made up of 5 separate lots, one of which has been identified from the Eastern Georgian Bay Natural Area Conservation Plan as a priority 3 parcel. It includes a combination of upland forest-barren rock barrens with both interior and coastal wetlands. 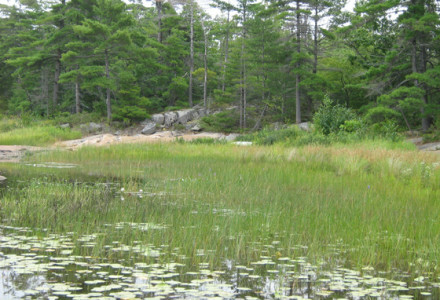 This assemblage of high quality, low disturbance communities provides ideal habitat for a number of Georgian Bay’s reptile species. Species that have been observed from the property include Eastern Hog-nosed, Eastern Foxsnake, Eastern Massasauga and Five-lined Skink. The northern shore includes an extensive example of coastal meadow marsh. For my 38 years of summering at the Bay Wabeno point, on Burnt Island, is a place of tranquility for me. I can observe a beaver house which was made under the dock of the old store, now torn down, as well as turtles splashing into the water as I approach in my kayak. On a sunny day the smooth rock of Wabeno point feels great on my bare feet. My daughter’s fiance, Chad, proposed to her during a champagne picnic at this special place. In 1904, my great grandfather Charles McGibbon built one of the first cottages very close to Wabeno Point. From there, the McGibbons, Baines, Becks and Jennings have established many cottages in the area. We are now at the point where my granddaughter and many of her cousins are 6th generation cottagers in the area.